Proof will be sent via etsy message. Once approved, final files will be sent. Thanks! 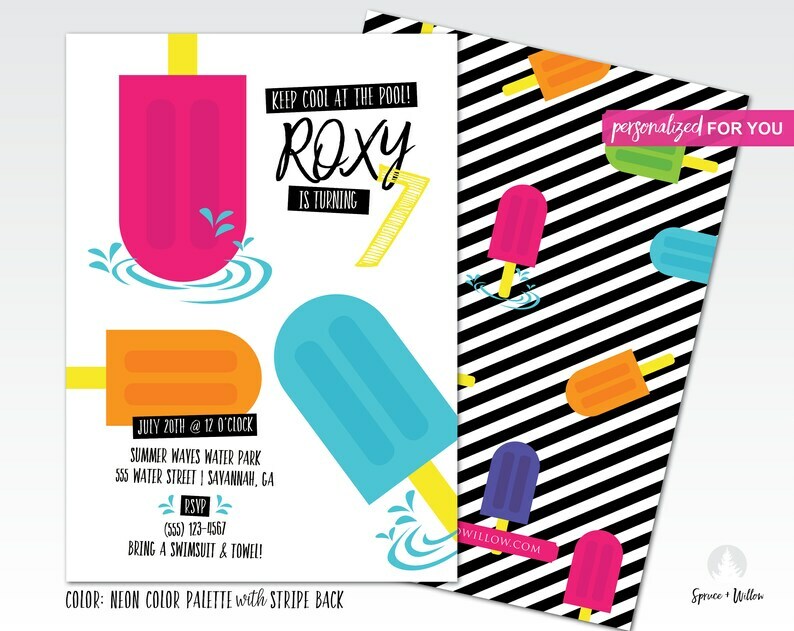 Popsicles + pool = the perfect summer birthday bash . Can be customized for any age. There are NO downloads attached to this listing. Downloads will be sent to your personal email after proofing. 2. Prior to checking out, please provide the following details in the “note” section. 3. Allow 1-2 business days for your custom design to be created. I will email you your custom design for proofing. Once you've approved the design, I will email you your final download. This is a custom download listing. Envelopes are NOT included in price. For your reference, this 5” x 7” card fits A7 envelopes (5.25” x 7.25”). Files will be designed 2-UP (2 designs to a page for printing and trimming efficiency) on an 8.5” x 11” sheet. Digital files will have ¼ inch bleeds and trim marks. All images will be high resolution (300 res). Envelopes ARE included in the price of your printed cards. 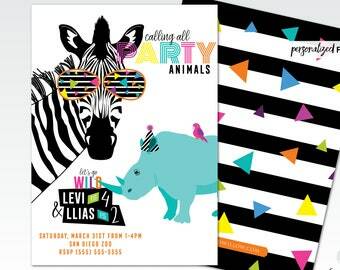 Your invitations will be submitted to the professional printing company once you have approved the final digital proof. Turnaround time is approximately 3-6 business days from approval of final proof until you receive your printed invitation order. Print orders are shipped via USPS Priority Mail. PRINTED INVITATIONS ONLY SHIP TO UNITED STATES ADDRESSES CURRENTLY. **PLEASE NOTE: All designs are for personal use only and cannot be resold or redistributed. COLOR DISCLAIMER: DUE TO VARIANCES AMONG COLOR MONITORS, THE COLORS ON YOUR COMPUTER MONITOR MAY APPEAR DIFFERENTLY THAN THE ACTUAL PRINTED PRODUCTS. IF COLOR IS IMPORTANT, PRINTED SAMPLES ARE AVAILABLE. JUST ASK! ALL SALES ARE FINAL FOR CUSTOM LISTINGS. Loved these! Seller was great to work with and the invites came exactly as I’d hoped. Got so many compliments on them! Absolutely great to work with! If you purchased a digital file and did not provide party details with your order, I will attempt to contact you via etsy and email to retrieve the information. If I do not receive a response with 30 days, your item will be marked "shipped" with NO REFUND.